Press Pass LA had the chance to preview the British fashion staple Topshop Topman as it unveils its new store at The Grove. The brand has been a British fashion authority since the 60’s known for dressing British rock bands and London’s elite with it’s flagship store at Oxford Circus in the West End. With U.S. stores in New York, Chicago, and Vegas, it was only a matter of time before they staged a British invasion of fashion hub, Los Angeles, and we could not be more excited! We had the chance to tour the massive store (newly expanded, but formerly the location of Banana Republic and opposite American Girl) and all it has to offer. Two levels of eye-catching and awe-inspiring women’s Topshop and men’s Topman fashion. The brand includes everything from suits and formal wear to jeans, beachwear, and accessories. Did I mention the fabulous selection of shoes? With bright colors, prints, and edgy style, it is sure to become a quick favorite of The Grove shoppers. We sat down with Gordon Richardson (Creative Director of Topman) and Kate Phelan (Creative Director of Topshop) to get the scoop on what to expect when the store opens this Thursday, Valentine’s Day! PPLA: Tell us a little bit about opening this store and the anticipation of that and what it means for the overall brand. GR: It’s just in one word, well in two words really, incredibly exciting! I think we’ve learned things in opening the other few stores first- New York, Chicago, Vegas. Each one’s told a different story but given us a bit of a rule book as to what we should do here. We’ve incorporated all that we’ve learned from that – how the store looks, adding new additions to it, changing some products, designing some new products, done some exclusive offerings- and what we’ve tried to do is bring the best British entertaining fashion that we can wherever we travel. It’s a bit like a traveling circus really! We’ve got a new range that we’re calling LUX which is a high-end redesigned range full of fabrics made in Lake Como off of Italy, so it’s a little bit more expensive. We’ve got more suiting then perhaps we had in wherever else we’ve opened because our suiting has done really well on our Topman side. We’ve got some Los Angeles exclusives as well that are only available here at this store. So this LUX range, for example, you can only buy here in the next two weeks. We’re not launching it anywhere else so all of this is totally exclusive to Los Angeles, so that’s really exciting! That’s a first too! We’ve never been able to do a whole capsule collection ready in time for a launch before. PPLA: So it’s exclusive here for the next two weeks and then will it be available througout all your stores? GR: It will go global after two weeks time. There are also some LA preview items there (points to a line of specially tagged items) that are strictly exclusive to this, store so once they’re gone, they’re gone! So we have a real casual and real smart mix really and that’s what Topman is all about. I mean you can wear our suits and rock up to a Grammy Awards party totally in a full suit or you can mix it down you know with a blazer and a chino. PPLA: What celebrities are wearing your brand and what type of clientele to you think Topman appeals to? GR: We’re not about celebrities, and I’ve always laid back from celebrities because we’ve never tried to endorse that celebrity thing. I think we unknowingly dress a lot of people rather than attach ourselves to one particular celebrity. I prefer that because fashion is about change so from the moment you endorse one celebrity, you are pinning it on them. Our brand is much more democratic. It’s about very easy, rich, fast fashion and I don’t know that I want it associated with one particular celebrity.I mean we dress loads of Rock and Roll bands because they like us, not because we feel we need to promote the brand. PPLA: How do you think Topman will compete with other stores here at The Grove, for example fellow British fashion store Zara which opened recently? GR: I think we’re like a bolt of electricity coming into the Grove- a bolt of fashion electricity! I think it’s just exciting; it fits like a sweet tooth! If you’re into fashion, it’s like a candy store, isn’t it? You want to come in and you want to shop and it doesn’t tag itself with one particular trend. I think some of those other retailers you kind of know the look before you go into the store, and the beauty of Topshop Topman is expectation. You don’t really know what you’re going to have but you know it’s going to be the fashion of the moment. Our trends change every month- that’s how quickly they change! I would challenge any of the other retailers in this arena, in that format, do they change that fast? I don’t know, but I doubt it. We run on fashion fuel and the beauty is it’s so versatile. If you have five guys come in on the weekend, I guarantee those five guys will come out looking completely different. But they will all look really fashionable. That to me is what this is really all about. We dont want them going out looking cookie-cutter or exactly the same. I want them to go out and have people think, ‘My God look, that’s amazing’ and it’s all Topman and all different. PPLA: Do you have a favorite piece in the store at the moment? GR: Well I am loving this whole new LUX collection. I am wearing one of their suits from it because it kind of suits me (laughs at the play on words) so I just love it! What’s really good at the moment from Topman, what’s really great about our menswear, is that it is all about prints right now and we haven’t had that for men in so long. You can actually clash and mix prints in the way that womenswear has for a while so it’s really great. I happen to be wearing plain today but print is good! PPLA: Tell us what some of your favorite items are in the store are right now. KP: There are so many favorite pieces that I would have to start you at the front of the store and work our way this way! In this area here is a bit of a pop-up trend, you have the mixing of the Geek T-shirt with this julie skirt, and then the Pow Wow (clothes with a cartoon-themed design). It’s really about finding your own personality within the clothes. It’s how you put it together, that’s the essence of what Topshop is about. So it’s not that you have to buy that and wear it like that (pointing to a full ensemble on a mannequin). It pulls you and draws you to be your own person and create your own style and have fun with fashion. PPLA: You have a wide range of clothes, you have everything in this store from casual wear to party dresses! KP: We think it’s really important to have everything that a girl can have. It’s like it’s the Pandora’s box of fashion. Whether you’re feeling in the mood for jeans and then you can wear it with a sort of trophy embellished jacket or you take the jeans and you dress them down with a sweatshirt and sneakers. It’s that same feeling and the same with the eveningwear and the prom dresses where you mix it up with the daywear. So you wear the denim jacked with the little prom dress, so you change it and you break the rules. You put your own spin on everything! PPLA: It seems that you’re very in touch with the L.A. lifestyle where people are running from one event to the next, day and night, and you can make a quick transition. KP: It’s true and I think especially in L.A. there’s a real sense of style like you say. The lifestyle is very different from the east coast so it’s much more relaxed. People have a much more relaxed way of thinking about fashion, and I think that’s exactly what you say is true.They just add accessories to sort of build the outfit up for the evening. You’re as likely to see a girl out at night with a pair of cutoff shorts and a little embellished T-shirt and some jewelry and high heels as well as with sandals and a bikini underneath. I think that’s a very L.A. thing and in the U.K .we really embrace that. I think we like that lifestyle and we like that relaxed approach towards fashion. I think our obsession with street style, in the way that street style is such a big impact on the way that we look, has really picked up in L.A. as well. PPLA: How do you think Topshop Topman will fit into the fashion landscape we have here in Los Angeles and specifically at The Grove with other stores like Forever 21, Zara, and Nordstrom? KP: The thing with Top Shop is that it fits into your world and it won’t be the only thing you buy but it will be the really important pieces that will make your style really individual. I think that’s what makes us very different from other people and other stores. PPLA: You opened a Vegas location just before this so you are now in New York, Vegas, and Chicago in the U.S. You could say you are kind of taking the U.S. by storm! Any plans to keep expanding in the near future? KP: We’re coming slowly but surely! They’re tiny steps really in such an enormous country but we’re also about to open 50 stores within Nordstrom all across America. They’re quite small but they’re there to give you an essence of the brand and of course you can shop 24 hours a day on TopShop.com so it’s important to have stores in really key cities and states. PPLA: It seems like you already have a celebrity presence in Los Angeles. You have tags throughout the store for example that say “Kate Bosworth pick” and I know you are doing private styling in the store over the next couple of days before you open. Can you tell us what other celebrities enjoy and support your brand? KP: Well you know everybody wears Topshop and it’s really flattering to see that people choose to wear it because they choose to wear it. It’s fantastic and we’ve got an incredible following of celebrities so we’re very proud about that, but it’s more about being a brand that everybody can wear. 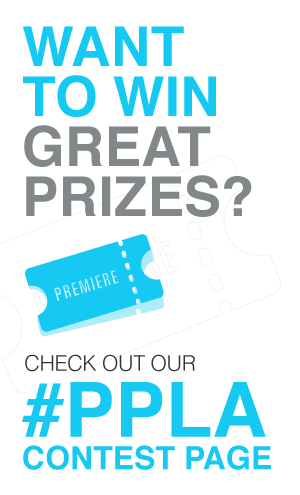 PPLA: For your opening day, you are having a British block party with surprise performances and giveaways, can you tell us what we can expect? KP: Well, I’m not allowed to say now am I (laughs) but it is going to be something really special. Topshop Topman CEO Sir Philip Green will be hosting a British street party (starting at 3pm on February 14th) which will feature live performances by Demi Lovato and Blood Orange, and opening moment with Kate Bosworth! We even heard a rumor they will be giving away gift cards and other prizes to the store and that there will be a “London Eye’ type ferris wheel to get the party started. The event is open to the public so don’t miss out! View our full photo gallery from inside the Topshop Topman store!